If you know of 101 ways to eat durians, please tell me! I only know a few ways which i would like to share with durian lovers and non-durian lovers alike, in other words, everyone! So I confessed I am a durian lover in one of my previous posts. If you dislike durians, well too bad because today, I am going to continue with my admiration for this spiky fruit! OK, OK, please don't leave, just bear with me. Who knows, you might just start to like durians? Eating the durian fruit by itself is the best way to enjoy its taste. But do you know there are many other ways of eating durians? Have you tried durian cakes? They are absolutely delicious! 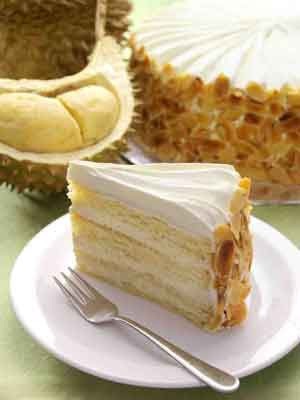 The famous and ever popular durian cake from Secret Recipe is a must try! I especially like it when it’s taken straight out from the fridge. 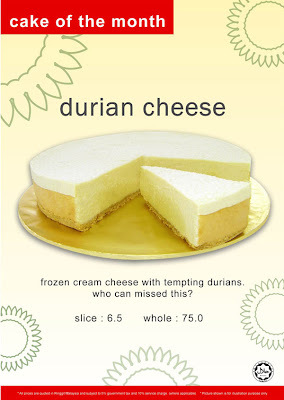 For the month of September, Secret Recipe also came out with their new durian cheese cake! Looks good, doesn't it? Honestly speaking, I haven't been to Secret Recipe for quite some time, so must give this durian cheese cake a try this week! Just when I thought Secret Recipe had one of the best durian cakes around, I discovered an even better one at Bon Bon outside Atria Shopping Mall in Damansara Jaya. Bon Bon’s durian cake is simply to die for. The generous chunks of durian flesh in the cake melt in your mouth and taste so good I can assure you resistance of this cake is futile. If you have been to Mid Valley Megamall in KL, then you would have probably passed by this shop called Sweet Chat. They have some pretty nice desserts, and one of them is of course the durian pancake! This pancake has real durian flesh inside instead of just durian puree. Nice! Inside The Gardens Mall next to Mid Valley, there is a shop called Lee Lee's Sumptuous Desserts at the lower ground floor which also sell quite similar pancakes. But I have not tried it before. Just found it at A Whiff Of Lemongrass blog. 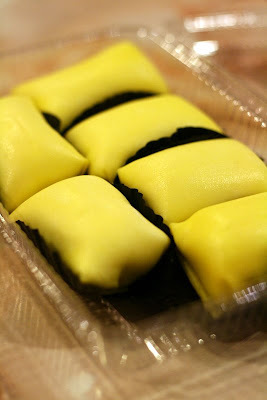 This photo of the pancakes (it’s actually called durian puffs) looks good, but I’m not sure if it tastes as good. Do you like egg tarts? If you do, why not give durian egg tarts a try? There’s a famous shop from Hong Kong in Pavilion KL called John King which sell all types of egg tarts. 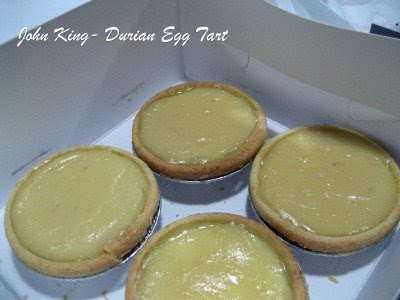 Do give their durian egg tart a try, though I don’t really fancy it. 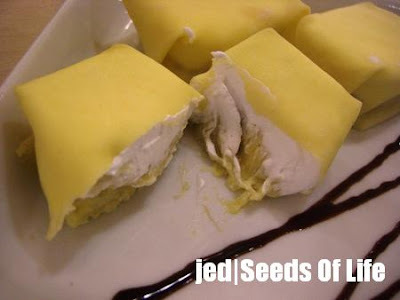 How about our very own Malaysian durian dodol? 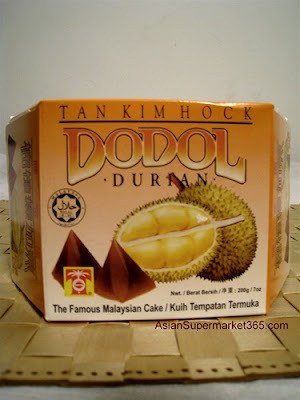 The most famous durian dodol is from Tan Kim Hock in Melaka. Even though it's not a favourite for me, the unique blend of durians and gula melaka makes this dodol a popular delicacy amongst Malaysians and foreign tourists. Now with the Mooncake Festival celebration this weekend, expect to see some durian mooncakes being sold! 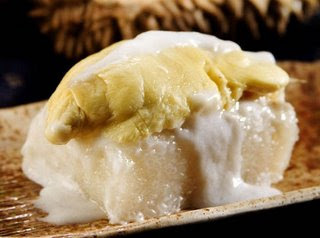 The Star recently reported that the snowskin durian mooncake from Shangri-la Hotel KL was voted one of the top five mooncakes by the StarMetro Team. If you like mooncakes and durians, then better get this Shangri-la Durian Mooncake before they are all sold out! I did not buy the Shangri-la mooncake because I think it will be way out of my budget. So I settled for Tai Thong's snow skin durian mooncake. It was delicious! And I bought it at 30% off the retail price so definitely no regrets! Here's the picture of the durian mooncake before I put it into my mouth! If you like chocolates, then do you know about durian chocolates? Yes, chocolates with durian fillings! For people like me, who love both chocolates and durians, this is truly a marriage made in heaven! 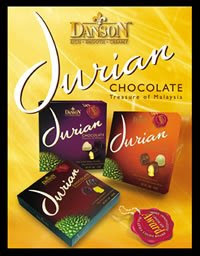 Come indulge yourself in Danson durian chocolates, a fine Belgian gourmet chocolate filled with rich creamy durian puree. Each box, priced at about RM27, comes with 9 pieces of exquisitely made chocolates. Not exactly cheap but you can be assured that it contains pure durians, and not simply "durian flavoured" ingredient. Furthermore, expensive gourmet chocolates like Danson has less sugar content than those cheaper ones sold in supermarkets and shops, so it's much healthier for you. 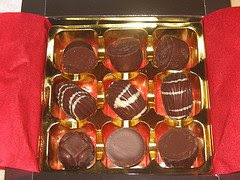 And don't forget that the chocolate itself contains polyphenols which help to prevent heart diseases. If you have ever been to Thailand, you would surely have eaten their very famous sticky rice with mango, which is actually a traditional dessert. Have you tried their sticky rice with durians? It’s real durians with glutinous rice topped up with coconut cream. Even more sinful than chocolate, let me tell you! The one I like best is found at the MBK (Mah Boon Krong) Shopping Mall in Bangkok. It’s sold by a lady at the Food Court on the 6th floor of the mall. Every time I go Bangkok, I never fail to go MBK to enjoy this sticky rice with durians! Even as I am writing this, I’m drooling at the thought of this delicious dessert! 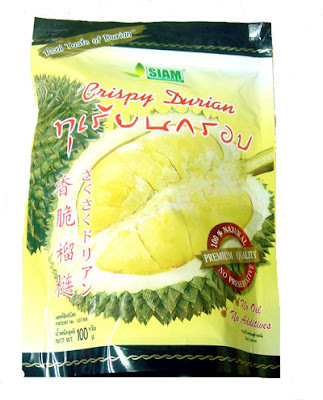 Talking about Thailand, they also have a very famous product called Crispy Durian, which is actually durian candy snack. If you’ve never eaten this snack before, do give it a try. You’ll be surprised how delicious it is! It comes in a tin or in a packet. Look for the brand name Siam. 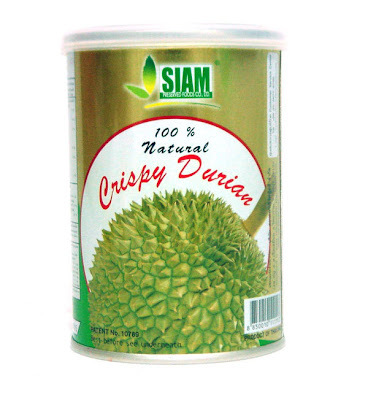 Siam’s Crispy Durian is the best durian candy snack in Thailand. The other time I brought back these candy snacks from Bangkok, they were finished up within 2 days! I bought 12 packets and gave 5 packets to friends. The remaining 7 packets were for me and my family and they disappeared within 2 days. Can you believe it? All my friends who tried it even asked for more. Call me crazy, but I don't mind flying all the way to Bangkok just to enjoy both the sticky rice with durian and the Durian Crispy snack! In Singapore, there is a shop that sells mainly desserts made from durians! 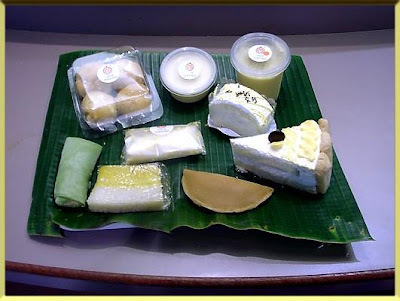 It’s called The Four Seasons Durian Dessert Shop located at 51, Telok Ayer Street at China Square Food Centre. Surely it must be the one stop centre for durian lovers everywhere! Just look at the variety of desserts they sell below! Or if you happen to go shopping along the famous Orchard Road, you might want to look out for hawkers selling durian ice cream like the photo below. Of course they sell ice cream of other flavours too, but we're talking about durians here. 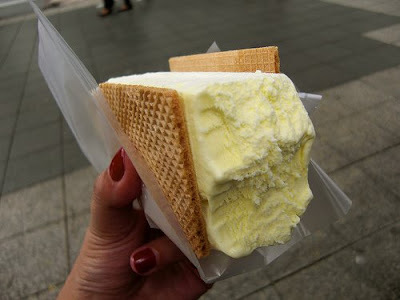 The ice-cream is sandwiched between two sheets of wafer. Isn't that yummylicious! Would you like to make your own durian ice cubes? I used to make them during my childhood days. It's so simple even a child can do it. Here's how. 2. Scoop out some durian flesh using a small spoon and place them inside every empty boxes or compartments in the ice cube tray. The durian flesh should fill at least half of the compartment. 3. Fill each compartment with water then stir with the small spoon. 4. Place the ice cube tray in the freezer. 5. Wait for a 3-4 hours, then take out the tray from the freezer and voila! you have your very own durian ice cubes! I was planning to make these durian ice cubes and take some photos of them, but unfortunately, when I got home, the durians I had bought earlier were missing! Now you know everyone in my family are huge fans of this spiky fruit! Zero durians equals zero durian ice cubes! Well, maybe next time. P.S. : As Foong mentioned at his previous post, eating durians and alcohol or brandy could really kill. My uncle died due to this lethal combination. Durian cake...drool!!!! And I love that Thai-style durian glutinous rice with santan dessert! Heavenly!!! The rest, I'd pass! Don't like...especially the very commercialised Tan Kim Hock dodol! my bug life, you can have my piece of durian cake - just print out from the blog. Haha! Yes, the Bon Bon durian cake is the best durian cake I've ever eaten - you must go try it! "pengat durian" sounds like a very delicious dessert! I've tried "pengat pisang" and it's delicious with huge chunks of real bananas. Is it almost the same ie. replace the pisang with durian? Sorry about your uncle - did he really die from this combination of durian and alcohol? Then it's not a myth like some people said. Funny some people reported no incident after taking both. Maybe there's a third factor like the person's overall health. I also don't really like the Tan Kim Hock dodol, maybe gotten used to it (or "sien" in Cantonese) since eating it when small. Quite an array you've got there, Foong. Somehow it's only durians fresh from the husk that attract me, the rest I can pass. But who knows, tastes change. SR durian cake so good ah? Okay, must go try after exam. Haha. I've never tried, smelled or even seen this fruit in person. The mere sound of it's name strikes fear into my nose and taste buds though. I like to watch Bizarre Foods with Andrew Zimmern and this is one food that he just cannot bring himself to eat. That has to say something because he has a stomach of steel and has eaten even eggs with rotten meat, but can't eat this fruit. Can you describe the smell and flavor? OMG Foong, I haven't seen this much Durian products, ever! I like Durian, I remember eating it while I was a child. Now, I enjoy the preserves more than the fresh Durian. I've tasted the ice cream but I'm not too crazy about it. Durian chocolate? Somehow that seems so wrong for me. LOL Have you tasted it? Wouldn't the strong Durian taste ruin the taste of the chocolate? babette, I have actually not eaten the durian chocolate before, but I can just imagine it and I know it's going to be very delicious! Well, at least that's what people who have eaten told me! I don't think the strong durian taste will ruin the chocolate, in fact I think it will complement it. u know, i just had the durian chocos! thought they were unique. this year, i think ill miss the durian mooncakes... unless there still are after today. I love durian! Too bad, I'm having my braces on. Eating durian would be messy, so I avoid eating it. quachee, durian bubble tea? Never heard of such a thing! Ok, will check it out at your blog! Wah... really a lot of good ways to eat durians le.. Personally, I only like to eat durian fruits and durian ice-creams..
omg! now, I feel like going to Mid Valley...hehe...YUMMY!!!! Oh, I've just die and go to durian heaven! Will try those when I go back next time. I like the durian desert at Mandarin Oriental. Yum! Your durian cake photos make me drooling! Not so fond of the dodol though. 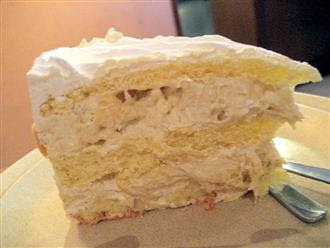 cbenc12, yes go try the durian cake at BonBon - you won't regret it! jam, me too. I think it's more for kids. I used to like it as a kid, but not anymore.